Basiliscus Film is a film production company based in the heart of Berlin. 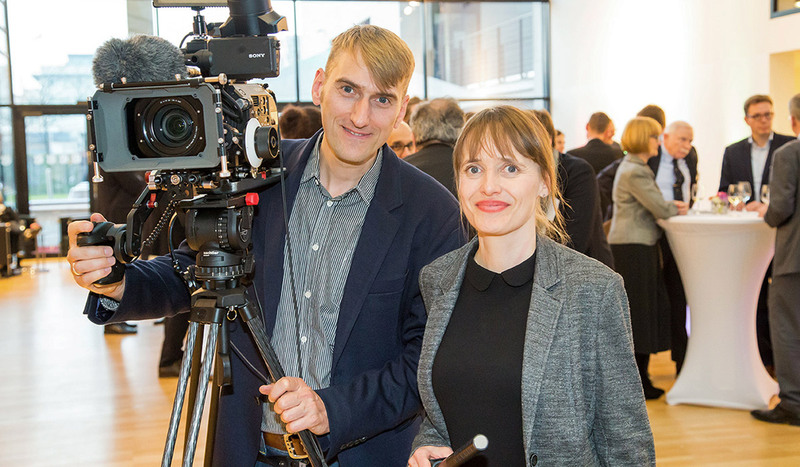 Since its foundation, Basiliscus Film has produced numerous high-quality documentaries and reports for TV magazines for various national and international TV channels. We have already won several prizes for this. For example, we received SILVER for the series »Masterpieces Revisited«, which we produced for Deutsche Welle, at the 2016 World Media Festival in Hamburg in the category »Entertainment Mini Series«. Most recently, our production for the Deutsche Welle »50 Kitchens, one City«, a fifty part series about Berlin based restaurants, won the »Intermedia-Globe Gold Award« in the category »Web & Web TV« at the World Media Festival 2018 in Hamburg. The film production Basiliscus Film also focuses on the production of corporate and event films as well as explainer videos. In our cinematic work we are interested in the aesthetic realization of ideas. We use our skills and knowledge learned over the past twenty years to ensure that your topics are in focus. At the same time, we sometimes realize our creative ideas and your individual wishes with unusual means. Each film should be an added value for you as a customer and at the same time an enrichment for the viewer. Our claims are high, but not unrealistic. We make modern, high quality films that are sustainable and people speak about. Films which came to life through personalities who trace fates and ways of life and point out perspectives. Our strength: We take our time, listen and look closely. We get to know your target group, develop individual ideas and also think about your budget. Film is our passion, which is reflected in the films we produce in different genres. Our roots are in art and journalism. But in recent years, we have expanded our cinematic spectrum more and more, deepened our knowledge and gained new experience with each film project. Quality, precision and a great dose of fun in what we do bring is shown in every single area of ​​our work. In all our projects we attach great importance to quality. That's why we look closely at the qualifications of our teams. We work with professional cameramen, sound engineers, EB teams and speakers. They use the latest camera and sound technology and are constantly continuing their education. Develop a dramaturgy in a few minutes, tell a story, convey important facts, objectively and informatively, at a high journalistic level. All this makes a good magazine report. We implement current topics from politics, culture and society with great experience, exciting and editorial-related for your mission. We are thoroughly researching, biting on a topic until we get to the bottom of it and following facts, not fake. How we can tell a good and complicated topic in an exciting way, that is something we decide with each new request. We look forward to your call. A reportage is emotional. It is always based on in-depth research, clear observations, interviews and comments. It mixes the subjective view of the filmmaker with facts and well-edited information. The spectators become eyewitnesses to a cinematic reality. We love television reports because they let us immerse ourselves in another world for a longer time. We as filmmakers and journalists always go on an expedition. The best part of this journey is to be surprised by the stories that life tells. A film documentary is probably the supreme discipline in journalism. It places a topic in a larger context, always keeping the objective view. As with the reportage, the documentation requires in-depth research. Sometimes it works additively with archive footage, photos and other documents to tell a comprehensive story. Interviews ensure authenticity. The documentation is closely related to current events, but has a thematically wide range. In a documentation, we as journalists always trace a certain theme and reproduce what we find. We love this work. It is a challenge and gives us the chance to sharpen our view of the world. A corporate film is like a cinematic glossy brochure about your company. It should be a statement for your customers and promise. Your corporate film conveys your corporate culture and introduces you, your team and your product. It is personal and at the same time professional, that's the only way it gets you out of the sea of ​​competition. We produce for you a corporate film tailored individually to you and thus help you to promote it on all relevant platforms. Do you have an industrial enterprise thaexcels in engineering excellence, that addresses the challenges of our time? Your manufacturing processes have been unique, effective and developed by you? And you want to bring this to a very specific target group? Then the industrial film would be just the right medium for you. Contact us. You are planning a special event in the near future and would like to keep it in your memory? Then an event video is just the right thing. In times of social media, the event film is also the ideal way to bring your company back into the conversation and provide the most up-to-date content. An event film not only lives from a spectacular event, but also from the creative realization. We help you to let your dreams come true. A web movie is a visual eye-catcher that puts your company or product at the center and provides all the important information for your clientele on the internet. It is a hip, very effective marketing tool and plays an important role especially in the social media area. You have a great product or offer a special service? You are bubbling with ideas and different topics that you want to best convey to a broad audience? We wrap your content in an expressive explainer video. This will make you even more visible on social media and your Google ranking will increase. Your products are your USP. With them you generate your clientele and position yourself in the market. The product film gives you the chance to explain your products precisely, to communicate functionalities and to make complicated techniques tangible. A product film supports your marketing and sales and is ideal for trade fairs, the internet or social media channels. A training film serves the education and training of your employees and is produced for in-house use. It should transport knowledge and often also a message. The training video conveys complex processes simply but memorable. This is how important know-how is passed on to employees in an entertaining way. A training film has a high learning effect, is fun and extremely effective. An advertising film is probably the oldest and most well-known means to arouse interest in a product, a brand, a corporation or an institution. Advertising means communicating with a clientele you wish to generate. But how do you get the attention you want in a time, flooded with many stimuli? How do you reach your clientele and stand out from the crowd? Advertising is to the point, precise, individual and entertaining. Produce your perfect commercial with us. Drone shots are a very impressive way to look at your company, your site and venue or your event from a whole new perspective. Corporate and commercial videos, documentaries and event films are now working with aerial shoots. The possibilities for aerial drone filming are endless. You need professional drone aerial shooting for your film? We are the professionals and we are happy to advise you. Time and time again customers and other interested people ask us, why we name our enterprise Basiliscus Film? Then the founder of Basiliscus Film tells his very personal story. „In my youth in the former GDR, since I was 12 I have been interested in animals of all kinds. While it was initially still fish in the aquarium, it became quite fast more exotic and I lay my focus on snakes and lizards, I increased feed insects, praying mantis and hunting spiders. My love for nature and the creatures of this earth developed during this time and remains an important part of my personality up to today. 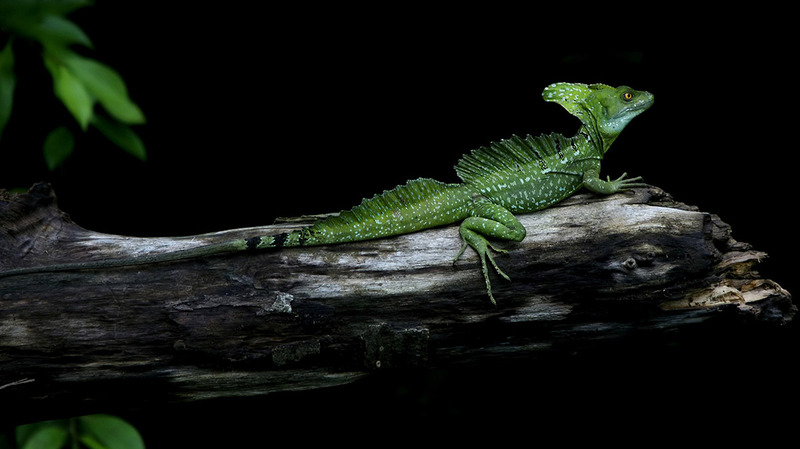 The Basiliscus Plumifrons, or the frontal lobe Basilisk is an iguana, living in the trees, which is native to the rainforests of Central America, and was one of the species that I bred in my terrarium. I was especially proud of the Basilisks, because it was not so easy to get to these animals in the GDR. I have chosen this name in honor of this Basilisk and the remote time. It was only later that I learned that the Basilisk was also a mythological creature, and since the Middle Ages it has appeared in various interpretations and illustrations as an allegorical symbolic figure."